The starting gun has been fired and the second full length album by Kim Lowings and the Greenwood is now fully available to the waiting world. A packed gathering at an eclectic venue in Kim’s hometown of Stourbridge provided the backdrop to the launch gig and the evening proved a resounding success to all parties involved. The most important part of this event is to celebrate the rewards of the endurance from making the album and set up the next phase of spreading the joys of the record to a wider audience. Being amongst family, friends and supporters can be as equally challenging as comforting for the artist, but Kim can reap enormous satisfaction from how the events unfolded which included a pair of sets from her temporarily enlarged band and the opening set from good friends, Hicks and Goulbourn. Scary Canary is a purpose fit new entertainment venue in the heart of Stourbridge and generally gears to more left field and underground music acts. It hasn’t yet branched out into hosting regular roots music nights, but possesses an intimate charm to be a useful addition to the West Midlands scene. The configuration proved a touch tricky in initially accommodating a large listening audience. However folks soon found ways to best view the proceedings which started shortly before eight and concluded a little after eleven. The Greenwood has a fairly settled three piece back line supporting Kim, but this evening the usual quartet was enhanced by the guest appearances of Leon Gormley (Cittern) and Lewis Jones (mandolin and Swedish nickel harp).This latter instrument played a substitute role for the violin which illuminates a number of the tracks on the new record. It was business as usual for the remainder of band with Tim Rogers playing his stoical role on Cajon and percussion and Dave Sutherland driving the double bass and adding the backing vocals. Last but certainly not least, Andrew Lowings has his usual quiet yet irreplaceable presence on bouzouki and bodhrum. The artistic package of Kim is evolving impressively as her writing and song inspiration skills develop to match the beauty of her vocals and highly crafted musical ability. The undoubted pressure of the evening, coupled with the odd technical difficulty plus shaking off an unwanted ailment were all dismissed with ultimate professionalism. Whether utilising her trademark mountain dulcimer, standard acoustic guitar or rising supremely to the challenge of the unaccompanied vocal piece, the effect was confident, assured and entirely consistent. The evening was obviously revolved around the new record HISTORIA and ten of the eleven tracks featured across the two sets. Kim followed the structure of the record by opening with ‘The Wood Wife’ before launching straight into the singalong track ‘Maggie’s Song’, which acts as the album’s most ear-catching tune. Quite often stand out live tracks can differ from the recorded originals and the most effective songs from the album to surface this evening were ‘Lullaby’ and ‘Regrets’. The second had a set list switch as Kim brushed off a minor technical difficulty to excel on this excellent showpiece of her vocal skills. ‘Monsoon’ and the instrumental piece ‘Alfrick’ were the two other new tunes to appear in the first set which also saw her return to two older numbers in ‘The Wonderful Mr. Clarke’ and ‘New Moon’. The latter of these two consisted of a re-work from its initial format and this theme of band re-interpretation was also found in the set’s concluding number, an original version of the standard traditional tune ‘The Cuckoo’. 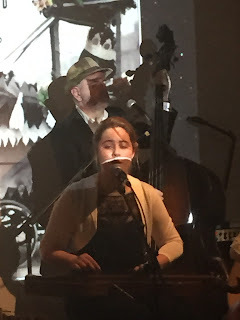 Running right through the night was Kim’s enthusiastic introduction to a majority of the songs selected, whilst sharing her passion for alternative folklore and the lure of traditional song. As if to make a statement that life after HISTORIA is underway, Kim introduced a further new song after the break with ‘In Spirit’ proving the successful culmination of her enchanted interest with folklore and this time, specifically Russian inspired. The second half had started with a solo song from Leon Gormley, before the band resumed roles and Kim revealing the source of her anger song ‘I’m Still Here’. However some onstage revelations remain such that. Following another song from the album ‘Willow’ and a number simply titled ‘Stay’, the remainder of the set focussed on a batch of traditional tunes; some dark, some upbeat but always forever folk. ‘Dark Eyed Sailor’ and ‘Bonny Labouring Boy’ both had recorded versions added to the album, while Kim decided to base the gig climax on two upbeat songs inviting the ubiquitous audience participation. ‘The Begging Song’ and ‘Away Ye Merry Lasses’ have become staples of a Kim Lowings’ show and would be significantly missed if ever removed. The enthusiastic and appreciative crowd refused to allow this to be the evening’s close and Kim needed little persuasion to return to offer a stunning version of ‘Annie Laurie’. The sparkling video performance of this song has been Kim’s major online selling tool for the last couple of years and hopefully the new record will offer further opportunities to promote her talent by the wonderful world of this popular medium. With a desire to ensure her loyal supporters had a full evening of entertainment, Kim invited the experienced North-East based roots duo Hicks and Goulbourn to open the evening. Drawing influence from a wide range of cross Atlantic sources, the virtuoso guitar-playing of Steve Hicks and versatile vocal and musical offerings from Lynn Goulbourn combine to engage their audiences with wit, fine music and entertaining song. Their confident persona set the bar high for Kim and the guys to follow, but nothing was going to phase the band on their big night. 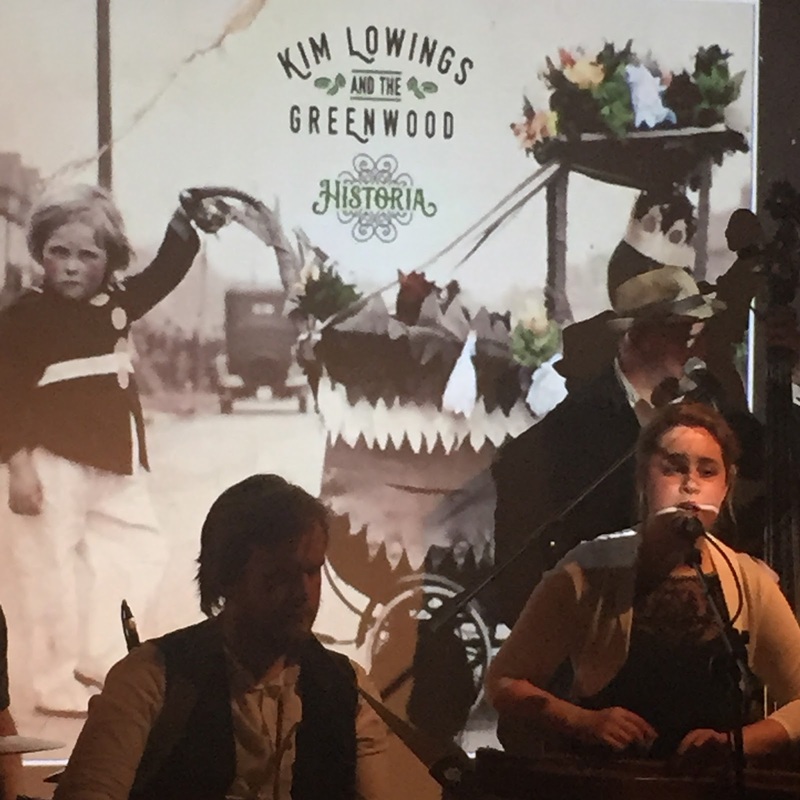 The major task is now for Kim Lowings and the Greenwood to successfully spread the word of HISTORIA and use a variety of mechanisms to grow their live following and ensure the album has many new homes. The quality of the product and the talent to convey it is undisputed. The music industry is littered with miscarriages of justice, but there is a positive feeling that this situation may not necessarily be the destination of HISTORIA and the wider talents of Kim Lowings.